Superb Clown Brooch with his green shirt & red payjama decorated with clear crystals all over his dress & cap. 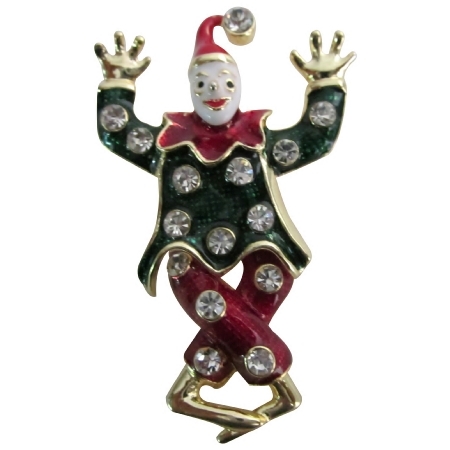 This brooch is the perfect gift for any clown lover or for anyone who enjoys wearing bright colorful costume jewelry. So whether worn to the circus or just to dress up a drab outfit whomever receives this brooch is sure to be delighted. Quality products were made with quality materials. Get yours today! That just needs some extra kick Glorious/Fabulous brilliant ! An absolutely gorgeous vintage brooch. Add a dash of drama with a bold eye-catching brooch. The brooch is beautiful crafted & authenticated attaches securely with pin clasp. Picture this lovely brooch on your favorite dress shirt scarf or jacket lapel.